Not many 14-year-olds have given speeches across the country for national audiences. Not many teens have had conversations with prominent leaders like Former President Barack Obama and Reverend Al Sharpton. Or created a company that inspires young people to dream big. Or taught business and public speaking to adult learners. Then again, not many 14-year-olds have the incredible gifts that Elijah Coles-Brown has. For the past several years, Elijah has become known as a talented motivational speaker and has traveled the country speaking in front of national audiences while also attending school – he’s a freshman at J.R. Tucker High School this year – and running his organization, Dreamers Imagine. 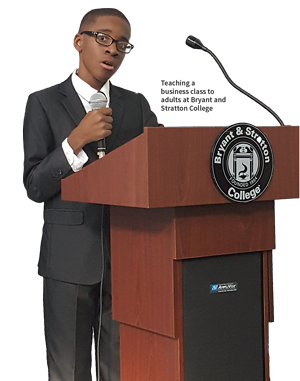 Elijah first began giving speeches when he was in second grade at Twin Hickory Elementary School, and his teacher required the students to deliver weekly presentations. “That’s how I got comfortable speaking in front of crowds,” Elijah says. The teachers and administrators recognized Elijah’s oratorical gifts quickly. “I remember Elijah just having a really big personality and big curiosity,” says Michael Dussault, principal of Twin Hickory. “He was always an unbelievable speaker. He had that gift for grabbing people’s attention.” Dussault says it was clear early on that Elijah was a natural leader. Elijah’s abilities to lead and inspire make him seem much older than his years. “He is like a 50-year-old in a teenager’s body,” says Dussault. The pastor of 31st Street Baptist at that time, Dr. Morris Henderson, says he saw Elijah as a child prodigy. “Elijah is keenly astute,” says Henderson. “He asks probing, and sometimes provocative, questions, and he has a keen knowledge of history.” As Henderson explains, Elijah’s understanding of history provides him with an important perspective and enables him to deliver compelling performances. preachers in Richmond and in Roanoke. 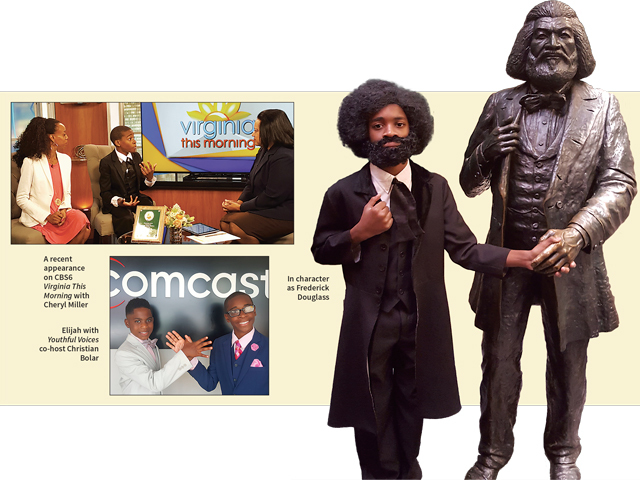 In 2013, he participated in the national Frederick Douglass Oratorical Contest and was awarded third place, and in 2015, he won first place in the competition at the junior high level. During that time, he alternated between performing Douglass and King’s speeches. “I even had to do Frederick Douglass and Martin Luther King, Jr. speeches back to back in multiple locations,” says Elijah. 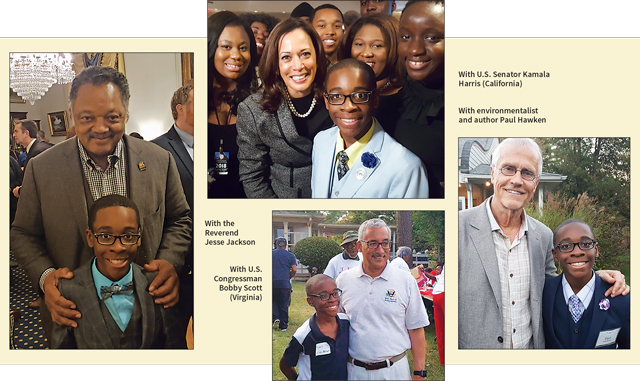 His audience grew in 2015, when Elijah, who considers engineering as a potential career path, was participating in a workshop at the National Society of Black Engineers in California. Although he had not planned to speak there, he offered to present part of King’s speech during a workshop, and then afterward, the instructor asked him to perform it in front of all attendees at the convention. Elijah has achieved success with performing these speeches because he doesn’t just memorize the words. He researches the speeches thoroughly so that he understands what every word means. “The point of being able to deliver the speech is to try to channel the power that was used when it was first delivered, and to be able to show that these words are still relevant today,” Elijah says. 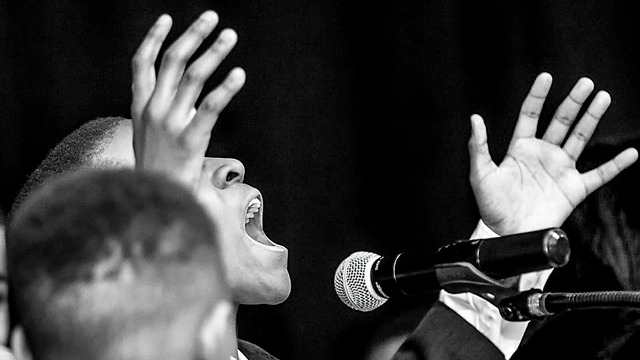 Elijah’s ability to engage audiences has opened up innumerable opportunities. Though he has just started high school, he has taught and assisted professors with public speaking courses – including a senior-level persuasion class at Old Dominion University – and he has taught business classes at Bryant and Stratton College. And although speaking has brought him the opportunity to meet inspiring people, like news commentator and author Van Jones and civil rights activist and politician Reverend Jesse Jackson, it has also brought about challenges. For starters, it takes an incredible amount of time to develop a speech. “When he’s called to do a speech,” his mother Brenda Coles says, “he has to do research and write a draft.” She then reviews the draft and guides him on changes. “He probably puts more work into his writing than people much older who make millions of dollars,” Brenda says. 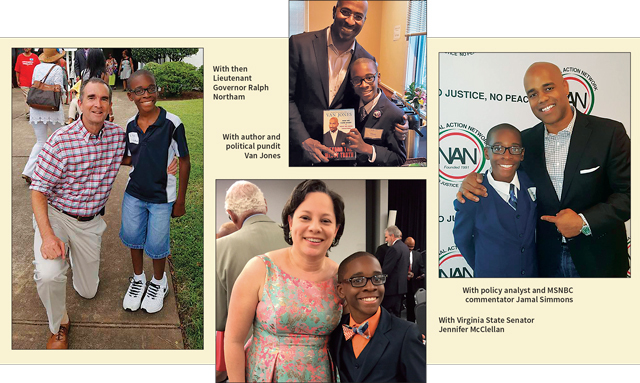 Elijah used his skills as a speaker and activist to support Taylor in her campaign to become Henrico County Commonwealth’s Attorney, and he also helped Councilwoman Scott when she campaigned. “He was like a little mascot for my campaign,” says Scott. “He just loves to hype everyone up.” In addition to campaigning for Scott, Elijah has helped her with holiday food drives and other community events, pitching in wherever needed. “He’s the type of person who goes where he thinks he can make a difference,” says Scott. Elijah helps underprivileged youth in the community through Dreamers Imagine, a multi-faceted organization he founded in 2014 to give back to the community. At the start of the school year, Dreamers Imagine, along with the Richmond Chapter of National Action Network, Sharon Baptist Church, and the Carol Adams Foundation, conducted a school supplies drive with local churches and organizations. The campaign culminated in a neighborhood event where they delivered the school supplies and brought in non-profit organizations to address the community’s needs. “We’re providing long-term assistance to families who haven’t yet been able to find that help,” says Elijah. Another facet of Elijah’s organization is Dreamers Imagine Productions, which develops stage plays based on historical figures and events. The company has a stage team – including a director, writer, and producer – and the cast members perform the plays at local venues. Last February, for instance, Dreamers Imagine Productions staged Freedom Day, about Frederick Douglass, at 31st Street Baptist Church. “These plays can be hard to watch, but they’re important to watch,” Elijah says. 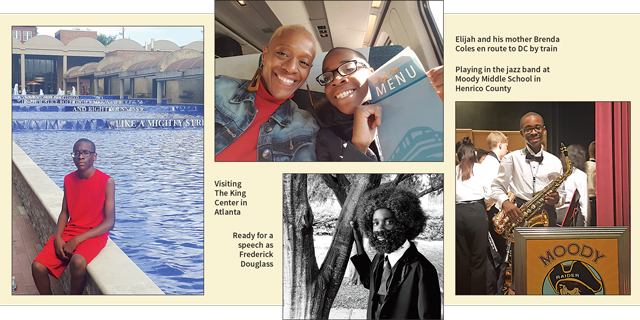 “They show everyone, no matter their age, what has happened in our past and how we can improve on what happens in the future.” Elijah, who played the role of Frederick Douglass in the production, says he thinks of himself as more of an educator than an actor. 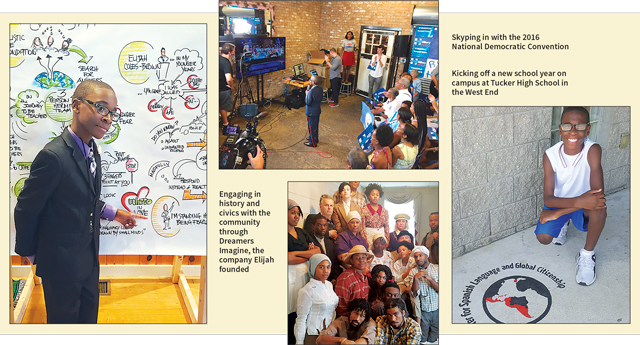 “I’m an actor who is trying to educate and show the community our history,” he says. Both Elijah and his mother credit God for his gifts. “It’s such a blessing that God chose me to be able to speak out and be a voice for the voiceless and be able to encourage youth,” Elijah says. Pastor Henderson describes Elijah as a spiritual person who has a deep sense of morality. “Elijah gives people a chance to see another way of living that is right, good, and moral,” Henderson says.